Have you ever sensed that someone was a Christ follower, but didn’t really know for sure? If so, what were the attributes or behaviors of the person? And if your suspicion was correct, what thoughts went through your mind after confirming? In the 2008-2009 timeframe, Mickey joined my team. Mickey was far more advanced in years than the majority of the team at the time, and I say this with all respect. She came with advanced wisdom, humility, ethics, and experience and it showed on a daily basis. Mickey was with us for a few years, but I didn’t get to know her really well as this group was part of a large, “around the clock” machine with an offshore team supplementing our onsite team, cranking out work on a high profile and high priority project. Mickey was quiet and generally kept to herself, focusing on doing her job to the best of her ability. While on the team, as well as in the years following the project when we had parted ways, Mickey would intermittently (perhaps every 3-4 months) send messages of encouragement to me. It was typically just a couple sentences and sometimes it would include a question to ask me how things were going. The messages were almost always on Friday afternoons when I was wrapping up work to prepare for the weekend. I’m not sure when it was or what she said, but I do recall a specific moment when I thought “is she a Christian?”. It wasn’t like she had sent a Bible verse or said she was praying for me, it was far more subtle; more like the pattern of kindness, thoughtfulness, and humility all showed up at once and I was hit with a big dose of Holy Spirit communication – this lady is special, and I knew her faith is in The Lord. Now several years later, Mickey is on my team again, and this time we do talk. I wanted to open up some communication with Mickey to confirm my suspicion so I shared a recent Bible Journal post with her. Her response was overwhelming. She shared that she has prayed for me through the years and continues to do so, and that she rejoices that she and her husband (of 50 years) share the bond of Christian faith with our family. She also wrote, “you are not just a co-worker and friend, you are my brother in Christ”. Beautiful words that brought me to tears because I realized that each time she sent the emails checking up on me, along with those was a secret prayer for me. I’m so humbled and honored by this. We now talk about Jesus, she shares her memory verses, reading plans, and recently she shared some prayer requests with me. Mickey is toward the end of her career and she is just plain tired; her husband drives her one hour each way to work five days per week, and at the end of the day she has little energy to do some of the things she wants to do outside of work. She feels that she needs to keep working for financial reasons, but she just doesn’t know how much longer she can go on at this pace. The joyful thing is that she’s put ALL of her trust in the Almighty God who is in control. May he be glorified through this situation. The lady who has prayed for me for years has asked me for prayer; this humbled me greatly; it is an absolute honor to pray for this woman. I wasn’t planning to put a Bible verse in this week because I just wanted to share this story and didn’t think any of the verses applied. While going through the reading one more time, these verses jumped out at me. I’m pretty sure Mickey isn’t an angel, but it reminds me of our interactions through the years, not knowing each other’s faith, but seeing opportunity to show hospitality to each other in a brotherly-love manner. 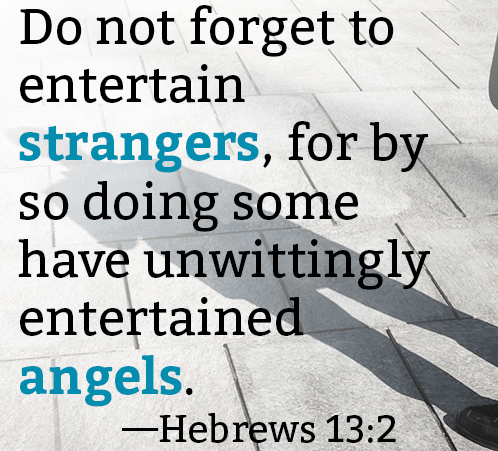 We never know who we interact with could be an angel praying for us and our families. Would you join me in praying for this fine lady today? Heavenly Father, thank you for your perfect plans; for teaching us to love one another like you love us, like your son Jesus loves us. We lift up Mickey today; please reveal your will to her with regard to her work situation. Give her strength and peace, beyond all understanding. Please give her continued discernment wherever she may roam. May her marriage of 50 years continue to honor you. She is a blessing to her family, friends, and acquaintances, I thank you and praise you for what you’ve done and continue to do in her life. We ask these things in Christ’s name. Amen. Next Next post: Sold out or holding out?